Are you looking buy a beach hand truck with big wheels? 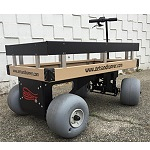 Handtrucks2go is proud to offer a full line of beach carts on sale now for all your families outings to the beach. Need a cart for bridge or beach fishing? We got you covered! Sandhopper Mini Motorized Beach Wagon 20" x 40"
Sandhopper Motorized Beach Wagon 24" x 48"
Our small or large beach carts come with extra big wheels so you can easily roll over the sand on the beach. Got a cooler and beach chairs to haul to the beach? Make it easy with our carts that have low pressure balloon tires that will roll easily over the softest sand! We also have bigger carts for resorts and hotels that will allow them to easily move beachfront equipment, such as chaise loungers, tables, and chairs, and all outdoor furniture, from the building to the beachfront with ease and convenience. Beach carts are something every beach-going family needs. Beach carts have extra big balloon wheels that will easily roll over sand to transport everything you need at the beach. This could include coolers, beach chairs, and food items, but anything conceivable you might want to take to the beach can be included. There are also commercial-grade beach carts that can be a tremendous boon to commercial enterprises that have to transport heavy equipment, chaise loungers, dining tables, and outdoor chairs. Beach carts are perfect for resort and hotel employees that couldn’t be expected to carry all of that stuff by hand. Beach carts can carry loads teetering on 100 pounds, which is plenty for whatever you may need to take to the beach. Coolers, several beach chairs, a beach umbrella, and more can all fit into a beach cart. A good cart should have several storage and access points for smaller items like sunscreen, food, and water. A tray or rack is also a good feature in a beach cart. 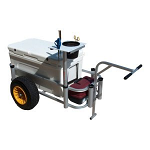 A personal beach cart will pale in comparison to what a commercial beach cart can carry though. Some people are a little wary to order because they feel that they may not work, that it could be a gimmick, or that it is unnecessary. However, once these same people actually purchase and start using them, all of their fears are allayed. It can also save you money if the local beach tries to rent out a chair or beach umbrella to beachgoers. You can bring your own, and save the money. In that sense, it’s a good investment. If you want to have a good time at the beach, you should bring a lot of beach equipment. You can’t be expected to personally haul and carry all that stuff by hand though. Especially for people that go to the beach a couple of times a week or every day of the week in the summer, a beach cart is indispensible. Even if it’s just for small items, it can make your beach experience a lot more pleasurable. Most of them roll like a baby stroller and are easy to operate. A sample set of items might include chairs, towels, a cooler, books, an umbrella, sunscreen, a tent, water bottles, food items, and tanning lotion. No one can expected to carry all of this stuff by hand at the beach. Just pull the beach cart out of the trunk of the car and you’re good to go. What Are Some Stellar Beach Carts That People Are Buying? Wheeleez Tub Style Beach Cart – If you have a lot of stuff to bring to the beach, then this is the cart for you. You won’t need to make numerous trips for all your gear if you opt for this beach cart. You can even take it over muddy terrain. Some of its core features include detachable wheels, kickstand, and balloon wheels. Norris Big Easy Handi-Cart – This contraption weighs just eight pounds, but it can carry up to 150 pounds. You can stow away newspapers and magazines in the back pocket, and you can even haul it across wooden floors and decks with its plastic tires. Wheeleez Folding Beach Cart – If you do not need a lot of extra capacity, however, then consider this smaller cart that you can just pull behind you. It has low-pressure wheels, and it was specifically designed to roll over soft sand. It is like dragging rolling luggage behind you. Beach carts are ideal accompaniments to the beach-going enthusiast. These products come in a variety of shapes, sizes, and weights for hauling all kinds of loads. You can easily carry huge loads or tiny sets in beach carts. Try to anticipate what you may want to do in the future. If you are thinking about getting an umbrella, beach chairs, or coolers at some point, go with a larger beach cart. If you know you are just going to want to take books, sunscreen lotion, and food to the beach, then get a smaller beach cart. You can always get one of each if you think you are going to alternate during the summer or if you want one for you personally and one for your family. 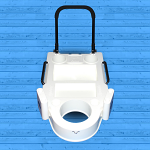 Don’t feel hesitant about purchasing this product. It is a godsend. The carts do roll easily over beach terrain, and they won’t get stuck in the sand. The easy transport of your beach gear should be a first priority this summer.